February weather in Texas is tenious at best. One year ago the February tournament day weather forecast was for snow and ice. The day dawned cold and dreary as only one fish was weighed in at the day's end. For this year's tournament snow and patches of ice covered the ground only one week earlier, but this Saturday brought a respite to the dreadful fishing weather. The fish at Lake Coleman cooperated beautifully. Membership in the club had increased dramatically so when I arrived at the launch site, the parking lot was full a full 40 minutes before the start of the tournament. After I unloaded my boat and motored out onto the lake, I was drawn back to fish previous areas that had provided success for me. That success was at a different time of the year and I really didn't know what to expect. I knew that in all likelyhood the fishing would be slow and I must be ever diligent as to take advantage when any opportunity presented itself with a strike. I was fishing my usual blueflecked worm along the southeast shore of the lake. I hadn't prefished any at all this year so I didn't know what to expect as to where the fish might be. About 7:30 I flipped my worm into some brush and slowly brought it out toward the boat. The water was about five feet deep and the lake water temperature was in the fifties. I sensed a heaviness to the line as I slowly moved the worm on the bottom of the lake. I lowered the tip of my rod and watched my fishing line. It seemed to move ever so slightly on its own. I took up the slack line and set the hook. I had a nice small bass on the line. I finally boated the fish and placed it in the livewell. I now had one that I could weigh at the end of the day. I continued to fish down the south shore with no success. I motored across the lake to fish a small creek that entered from the north side. The creek provided good water depth in the channel with shallow water holding to the flats and brush. I worked these areas as slowly and thoroughly as I could with no action at all. A little after 2:00 p.m., I cast my worm toward some logs and brush and began a slow retrieve. I felt nothing through my line but noticed my line was moving toward me. A bass was swimming toward me with the worm in its mouth. I took up my slack and set the hook. I had a fish on and soon brought the fish over the side. The length of the fish was very close to 14 inches. I got out my golden ruler and measured the small fish. I could barely get 14 inches from the fish if I turned it just right. I didn't think that it would pass muster at the weigh table, but better to allow the tournament officials decide than to summarily release a fish that might otherwise count in my total. I was watching my watch closely as I was trying to catch that one large fish that would help me in the standings. I knew that I must allow myself enough time to return to the launch area in order to be ready for the weighin. I set my sights on a point of land extending into the lake at the entrance of the creek. The water dropped sharply from the land into 15 to 18 foot depth. I had a pickup of the worm and soon boated a two pounder to put in the livewell. I knew that I had two fish that I could weigh and was hoping that the smaller one would measure 14 inches and not be too short. I made it back to the launch area with fish in hand. I was amazed at how many members were fishing the tournament. 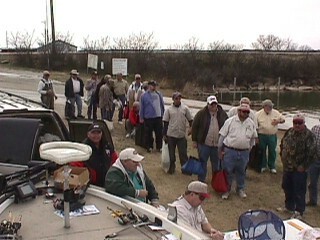 Fifty-four members and five guests fished this February Saturday. It seemed that the weigh in line stretched forever. Several members were weighing three nice fish while many others weighed one or two with very respectable weights. A few members had the luxury of culling their fish to bring the three biggest fish to the weigh table. A common pattern seemed to emerge from those who were most successful. They had found the fish hanging in about 8 to 15 feet of water adjacent to structure. Their success was not due to a secret lure or a special bait but to the ability to locate the depth and level that held the feeding fish. Those who were successful were able to do just that as five different stringers were weighed at over 9 pounds each. As a Christian, I want to follow Christ's great commission and direction in his service as I try to show others his love and sacrifice through my daily living. My problem is that I don't always know how effective I really am in influencing others to follow Him. I sometimes feel the same way in serving Him as if I had fished all day with no results. When fishing this way, I don't know if I needed to change technique or lure or both. I have a comfort zone that I've fished before and I don't always want to change when conditions warrant the change. I know as a fisherman, success is tied to discovering and knowing the fishing conditions and be willing to move out of any comfort zone to find the level and depth that holds fish. In the same way a Christian must be willing to move out of any comfort zone to find the Lord's will in his or her service for Him. It's not always doing the same thing that one has always done before. One must be willing to follow Him in any new direction when He calls and He will reveal the right depth and level for any Christian to be more successful in His great commission. Now, where is that new fish finder?